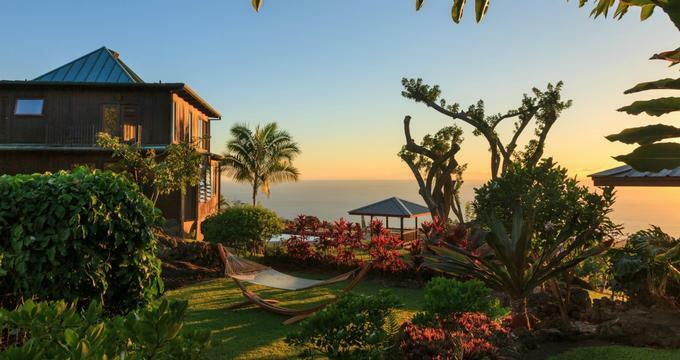 Located on the slopes of Mount Hualalai in the heart of Hawaii’s Kona Coffee belt, the Holualoa Inn promises an unforgettable and extraordinary Hawai’ian experience. 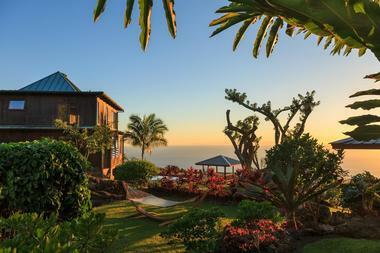 Resting at 1,400 feet above sea level among acres of enchanting tropical gardens, coffee trees, and fertile pasture land, the property boasts breathtaking views, distinctive and stylish accommodations with Polynesian accents, an array of amenities and facilities, and gracious hospitality. 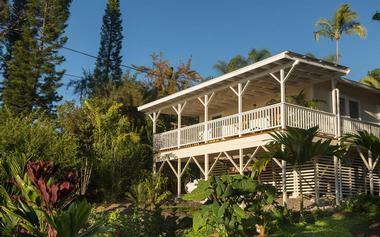 The charming bed and breakfast is within walking distance of the island’s beautiful beaches and activities, as well as the shops, restaurants, cafés and other attractions of the nearby village of Holualoa. The Holualoa Inn features distinct and well-appointed accommodations in the form of four guestrooms, two luxury suites, and one traditional cottage. Each of the lodgings features stylish décor with Polynesian accents, comfortable furnishings, spacious living and dining rooms with plush sofas and armchairs, and bedrooms with double, queen or king-size beds in deluxe linens, down comforters, and hypoallergenic pillows. En-suite bathrooms have showers/baths, fresh bath and beach towels, Noa Noa cotton robes and fleece socks, and branded toiletries. Modern conveniences in every room include ceiling and tower fans, iPhone/iPod docking stations with clock radios, hairdryers, irons and ironing boards, luggage racks, and high-speed wireless Internet. 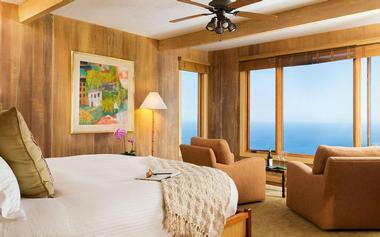 The Gardenia Suite features a king-size bed dressed in deluxe linens, down comforters, and hypoallergenic pillows, an en-suite bathroom with a walk-in shower, vanity, fresh towels, and organic bath amenities, a spacious sitting area with a queen-size sleeper sofa and a private balcony with beautiful garden and ocean views. The Plumeria Suite features a king-size bed dressed in deluxe linens, down comforters, and hypoallergenic pillows, an en-suite bathroom with a walk-in shower, vanity, fresh towels, and organic bath amenities, and a spacious sitting area with a daybed and private television, and lovely views of the swimming pool. The Coffee Cherry Room features a king-size bed dressed in deluxe linens, down comforters, and hypoallergenic pillows, an en-suite bathroom with a shower-over-bath combination, vanity, fresh towels, and organic bath amenities, and a spacious sitting area with a private hot tub spa and stunning garden views. The Ginger Room has a queen-size bed dressed in deluxe linens, down comforters, and hypoallergenic pillows, an en-suite bathroom with a walk-in shower, vanity, fresh towels, and organic bath amenities, and a spacious sitting area with a private balcony with beautiful garden views. The Hibiscus Room offers a king-size bed dressed in deluxe linens, down comforters, and hypoallergenic pillows, an en-suite bathroom with a shower-over-bath combination, vanity, fresh towels, and organic bath amenities, a spacious sitting area with comfy seating, and beautiful garden and ocean views. Guests staying at the Holualoa Inn are treated to a sumptuous breakfast every morning, including traditional dishes, local specialties, fresh fruit platters of seasonal papaya, figs, banana, avocado, lilikoi, citrus, and pineapple, juices, and 100% estate brewed Kona coffee. 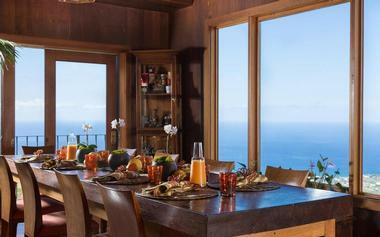 Homemade sweets are served every afternoon, and beverages are available throughout the day. 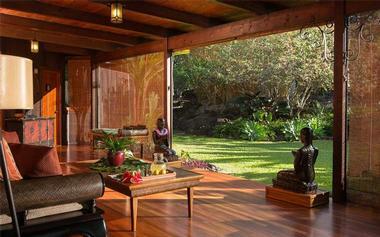 In addition to spectacular Pacific Ocean view, luxurious accommodations, and over 30 acres of lush tropical gardens, the Holualoa Inn offers features an array of amenities, including a custom-tiled mosaic pool and hot tub, expansive lanais with fragrant aromas, rooftop and garden gazebos and private verandas. The Inn features several communal spaces where guests can relax, including the indoor-outdoor Great Room, which features traditional Polynesian furniture, select works from local artists, a working fireplace, and panoramic garden views. Guests enjoy breakfast every morning in the sunny dining room that is bathed in soft light and boasts beautiful views of the Kona coast. The Holualoa Inn offers an idyllic and romantic venue for romantic and destination weddings, receptions and other special celebrations. From intimate gatherings to grand weddings for 100 guests, Holualoa Inn venues include the Malulani Pavilion with breathtaking panoramic views of the Kona Coast. The Holualoa Inn is situated just outside the magical Hawaiian village of Holualoa on the Mamalahoa Kona Heritage Corridor. This spectacularly beautiful area offers a wealth of attractions, activities, and attractions, from exploring the celebrated artists’ village, which is home to a variety of shops, galleries, and restaurants and colorful buildings that once housed The Old Post Office, the Hayashi Hospital and more. The Inn is situated in the heart of the Kona Coffee Belt, which is home to a wealth of coffee farms that produce award-winning local coffee.